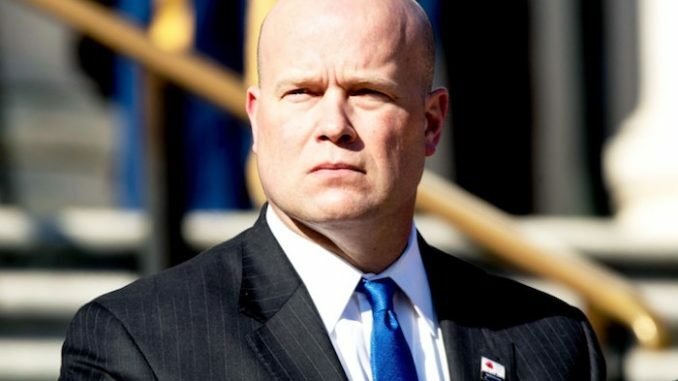 Acting Attorney General Matthew Whitaker has been cleared to oversee and potentially shut down the Mueller probe. After a failed attempt by Democrat Senators Blumenthal, Whitehouse and Hirono to block Whitaker “from serving in any office within the federal government,” ethics officials cleared Whitaker to take over the Mueller probe on Wednesday, stating that he does NOT need to recuse himself. FOX News reports: Acting Attorney General Matt Whitaker will not recuse himself from overseeing the Russia probe, despite mounting pressure from Democrats who cite his “hostility” toward Special Counsel Robert Mueller and his investigation. A source familiar with the matter told Fox News on Thursday that Whitaker met with Justice Department ethics officials this week, who told him he was not precluded from overseeing Mueller’s investigation into Russian meddling and potential collusion with Trump campaign associates during the 2016 presidential election. Whitaker, who served as chief of staff to former Attorney General Jeff Sessions until Sessions was fired, has faced extreme pressure from Democrats to recuse himself to ensure that Deputy Attorney General Rod Rosenstein continues in that role. Sessions recused himself from overseeing the probe due to his work on the Trump campaign in 2016, turning control to Rosenstein, who appointed Mueller on May 17, 2017. The DOJ says it plans to send a letter to lawmakers on the Hill later on Wednesday, explaining Whitaker’s stance on not recusing from Mueller’s Russia investigation.